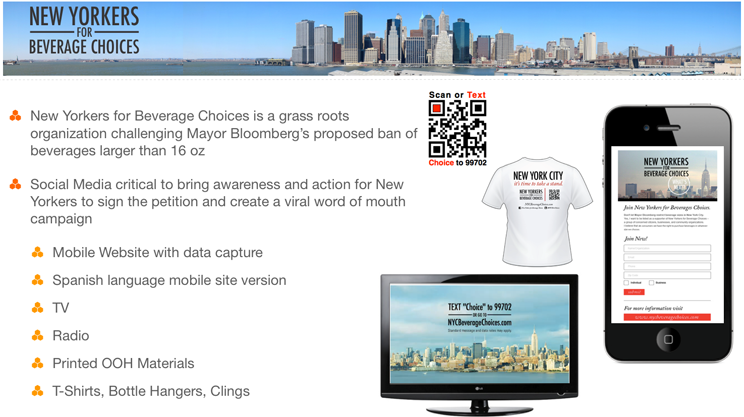 ApolloBravo developed multiple elements of this advocacy campaign supporting New Yorkers for Beverage Choices. The mobile optimized website was linked to a multimedia blitz utilizing a ShortQR™ that combined the best elements of a short code and QR code. The website included integrated device detection allowing users to be automatically directed to the correct website based on mobile or traditional browsers. Social media was integrated into the campaign to bring action and awareness driving petition sign-ups.